"What do you read, my lord?" - "So what's your strategy?" "What do you read, my lord?" How did this craziness happen, you ask? I ask myself the same thing. Funny story, really. "TEIN" is now the longest fic I've ever written, having dethroned "The Hour of the Wolf" seven hundred words ago. And... wow. Thirty chapters. Damn. I've never had to title something "Chapter Thirty" before. ...actually, looking, that's not true; when the Emo Assassin (no, seriously -- he was emo before emo was in; it was a COUP) Book I started in the tenth grade stalled last year, it had come to 95,000 words and was in the middle of the thirty-fourth chapter. Whoo! 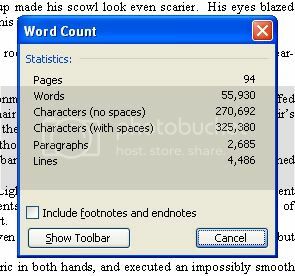 I think the highest word count I've gotten was 66,000, or something around there. I'm hoping to get up to 80,000 with 8&8th. That would be wonderful.